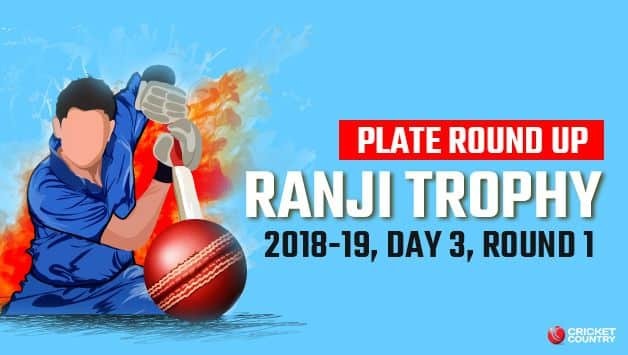 A round-up of the Plate Group matches on day three of the 2018-19 Ranji Trophy. A round-up of the Plate Group matches on day three of the 2018-19 Ranji Trophy. Recap day two here. Skipper Yashpal Singh’s century went in vain as Sikkim notched up a win by an innings and 27 runs against Manipur in their Ranji Trophy debut at the Jadavpur University Campus Ground in Kolkata. Resuming the day on 123 for 2, Manipur produced another forgettable batting display with only Yashpal and Lakhan Rawat coming up with significant contributions. Manipur’s only batting highlight was their partnership of 112 runs for the third wicket. Once Lakhan fell to Padam Limboo, it all went downhill for Manipur. Ishwar Choudhary (3/52) and Bipul Sharma (4 for 55) ran through the middle order to share seven wickets between them. 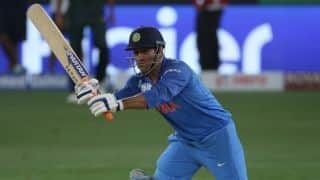 Only two of the last seven Manipur batsmen could enter double digits, and despite Yashpal’s defiant effort of an unbeaten 132 with 21 boundaries, he kept losing partners one by one before the side was eventually bowled out for 266. Take Yashpal’s innings out of equation and Manipur’s second innings would have been no better than their first. Brief Scores: Sikkim 372 all out beat Manipur 79 and 266 all out (Yashpal Singh 132*, Lakhan Rawat; Bipul Sharma 4 for 55) by an innings and 27 runs. Nagaland couldn’t have asked for a better Ranji Trophy debut. Led by a five-wicket haul by allrounder Abrar Kazi, Nagaland bundled out Mizoram for 91 in their second innings to register a huge win by an innings and 333 runs. Nagaland needed 15 overs to wrap things up at the Nagaland Cricket Stadium in Dimapur. Resuming the day on 16 for 2, they were reduced to 65 for 4 at lunch. It was during the second session that Kazi, building on his double century in the first innings, broke the back of Mizoram’s middle order to finish with 5 for 13 and take his match tally to nine wickets. Taruvar Kohli was the highest-scorer, unbeaten on 48. Brief Scores: Nagaland 530 for 8 (Abrar Kazi 200; Moia 3 for 90) beat Mizoram 106 all out and 91 all out (Taruvar Kohli 48*; Kazi 5 for 13) by an innings and 333 runs. Unbeaten half-centuries from Puneet Bisht and Yogesh Nagar helped Meghalaya register a comfortable seven-wicket win over Arunachal Pradesh at the Meghalaya Cricket Association Ground in Shillong. The day began with Assam at 104 for 6, Gurinder Singh picked up 4 for 21 to shut the innings on 131. Meghalaya, needing 157 to win, lost two wickets for 18 runs, but there would be no repeat of a first innings performance from them. Jason Lamare scored 29 off 41 before he was dismissed by Sandeep Thakur, but Bisht and Nagar combined to add unbeaten 109 runs for the fourth wicket to see his side home. 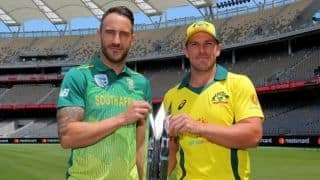 Bisht (66*) scored at a strike-rate of almost 95 with 12 boundaries while Nagar scored at over a run a ball with nine boundaries and a six to remain unbeaten on 55. Brief Scores: Meghalaya 141 all out and 157 for 3 (Puneet Bisht 66*, Yogesh Nagar 55*) beat Arunachal Pradesh 166 all out and 131 all out (Kshitiz Sharma 41; Gurinder Singh 4 for 21) by seven wickets.